Unlike many other sports the ball in golf is stationary. This allows you a lot of time for thinking, and this can lead to performance anxiety as negative thoughts pop into your mind. It is one thing to be able to hole putts on the practice putting green, but can you take this ability to the course? The more you can putt on automatic pilot, the less chance there is that you will tense up over the ball. A pre-putt routine is a consistent and systematic procedure to help you cope with pressure by placing you in a non-thinking mode prior to starting your putting stroke. It is a focused time-based ritual that you perform before you pull the trigger on the putt. It should be simple, but exact. It allows you to commit to your putt with confidence. The biggest fault, when faced with an important putt, is getting out of your normal routine by trying too hard - by either speeding up or slowing down. For example, a well-rehearsed routine of one look and then go, becomes three or four extra looks accompanied by a lot of staring, shuffling, and over-deliberation. An important part of building a pre-putt routine is how you organise the individual steps. Pia Nilsson and Lynn Marriott in their excellent book Every Shot must have a Purpose introduces the concept of a Think Box and a Play Box. When you are in the Think Box you are analysing the variables of the putt that you are faced with. You are getting the information about the slope, the speed of the green, and the break. You are visualising the putt, rehearsing the putt as you see in your mind's eye the ball run to the hole and fall in. When you step forward you cross the Decision Line and enter the Play Box. This is the time to quit thinking, commit to your aimline and just putt. This is not the time for second-guessing yourself. Doubt leads to tension and a poor stroke. If you are not comfortable, you must go back to the Think Box and start you routine again. Before you build your pre-putt routine, you need to know the difference between Practice Putts and Rehearsal Strokes. Practice putts are concerned solely with stroke mechanics and should be kept for your practice sessions when you are working on your stroke. However, they are also useful just prior to your round as a reference to the speed of the greens. On the other hand Rehearsal Strokes relate to when you are out on the course. Their purpose is to help you visualise and gain a feel for the putt while you are standing alongside or behind the ball. Most golfers take their rehearsal strokes alongside the ball rather than behind it. Dave Stockton recommends that you don’t do this as it is easy to lose the mental picture of your aimline and the required delivery speed. In fact, he recommends not taking any rehearsal strokes. I don’t think that a rehearsal stroke alongside your ball is the best place for these additional reasons. As soon as you place your putter down alongside the ball, there is a chance that the soling of your putter may cause the ball to move. If your ball moves, you will incur a one-shot penalty as the inference will be that you were the cause unless it is known or virtually certain that you were not the cause of your ball moving. On a breaking putt if you aim at the hole during your rehearsal stroke, instead of parallel to your aimline, you are changing the angle of your aim. You could end up sending a mixed message to your brain. For a pre-putt routine to work, you must follow diligently until you can do it in your sleep, so to speak. 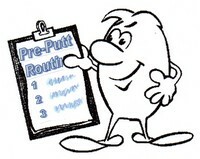 If you change any part during your round, you have in effect created a new pre-putt routine. The simpler, less noticeable your routine, the more effective it will be. You should avoid an elaborate routine with a lot of hard-to-remember steps. One look and then Putt. If you have to focus too hard on getting the steps in the correct order, you should rework your routine. It shouldn’t hold up play nor cause your playing companions to mock you for your eccentricity. You should develop your own pre-putt routine, one that you are comfortable with and can use with confidence. It should have a certain rhythm and flow to it and attuned to your pace of doing things. There is no best routine, and if you watch the routines of pro golfers you will see each has personalised their routine. Besides a pre-putt routine there is also a post-putt routine. This gives you feedback on how your ball travelled over the surface you had to negotiate. On putts where the hole is within your peripheral vision, it is still good advice to abandon visual feedback, and listen not look. Nick Faldo used to keep his head so still that he had to ask his caddie on which side the ball missed if it didn’t go into the hole. However, on long putts once your ball is away, you should watch carefully the break at the hole in case you may have a come-back putt. Another important part of your post-putt routine is how you react after your putt. allow yourself to get angry and frustrated when you miss what you consider is a makeable putt? accept the result and evaluate the putt not on result, but how good a stroke you put on it? Your post-putt reaction will determine your state of mind and your eventual score. Any negative self-talk can harm your putting and undermine your confidence. You may have seen a professional tapping down an imaginary spike mark after missing a putt? It is a way of saying "I made a perfect putt; it was the spike mark that caused the putt to miss."